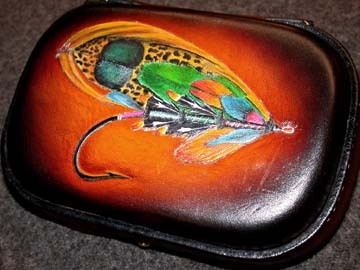 Fly Cases: I've developed many fly case designs and continue to create new ones. I can illustrate your piece with any fly, fish, or other image you choose. My trademark clamshell fly case can be made in three sizes. 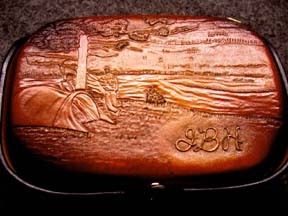 The small case (6" x 4"x 1.5") starts at $350, for a simple case with one image carved and painted on the front and three initials carved on the back. The medium case (7" x 5" x 1.75") starts at $400. 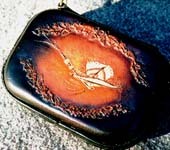 And the largest size clamshell case, The Haddock style (6" x 9" x 2.25") starts at $500. I hand make all my cases from the patterns on up, including doing all the stitching, carving, painting, and dyeing by hand. I make all the straps, handles, pockets, etc, myself, as well. 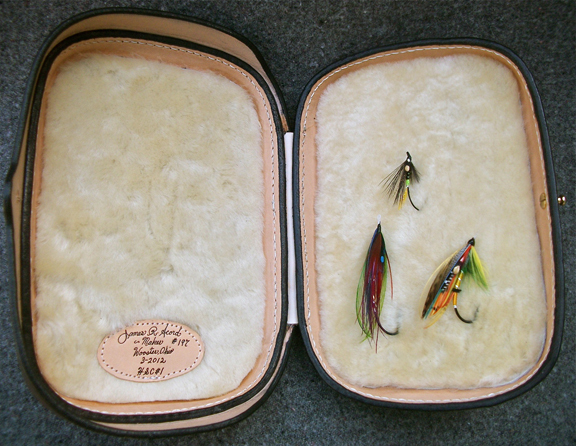 The Haddock Case, a larger clamshell fly case for Salmon and Steelhead flies. 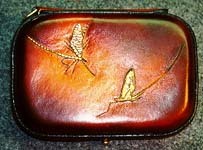 I made this first larger size clamshell case for Craig Haddock of Mattawan, Michigan, who's an Atlantic Salmon Fly artisan. The new case size is 6" x 9" x 2.25"deep. Being significantly larger, it easily carries the big flies used in Salmon and Steelhead fishing. A case this elaborately carved and painted will cost at least $1,000. plus shipping. More simple cases, with one image on the front and your initials on the back will start at $500. plus shipping. An order for a case fancier than this one, as in having a mural on it, we'll work out a price together, which will be higher than this one's. I hand carved oak leaves around Craig's signature fly for this piece, but will design whatever you want on your case. If the fly is rare or your own creation, you just need to provide a good image of the fly you want me to create for you. 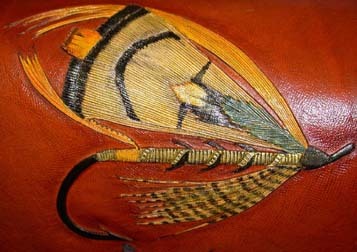 Same with a special fish image you want carved. This is Craig Haddock's signature fly, the Glen Fiddich, which has won awards and now lives in a shadow box in England. 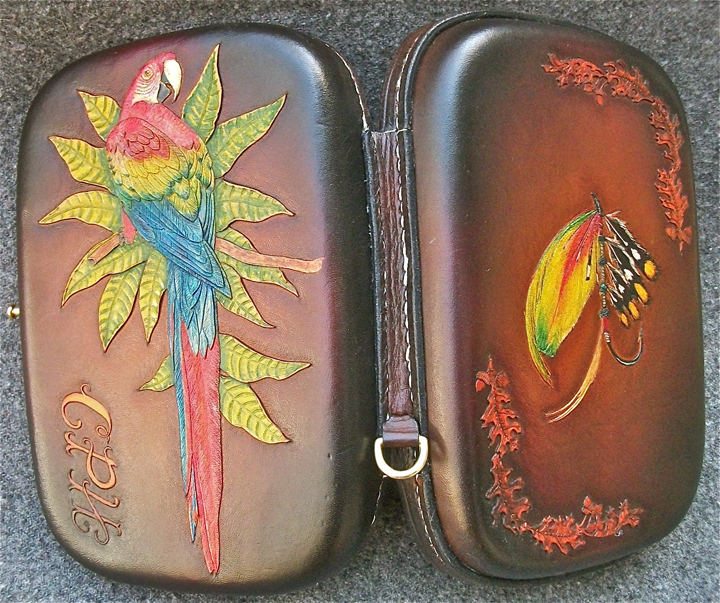 We chose to put a Macaw on the case, because Craig uses Macaw feathers a lot in his flies. 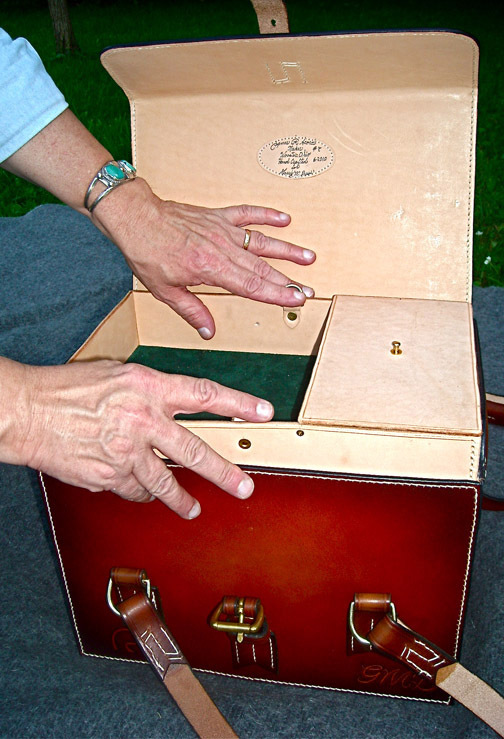 Because this is a presentation case, Craig wanted shearling on both sides of the case. You can choose to have my handmade cork strips that will hold large dry flies on one or both sides of your case, as you can see below in another case's inside view. Inside my cases, I put the combination of natural shearling and my handmade cork strips, depending on your needs for fly storage. On each label, I include the case's number and the date. 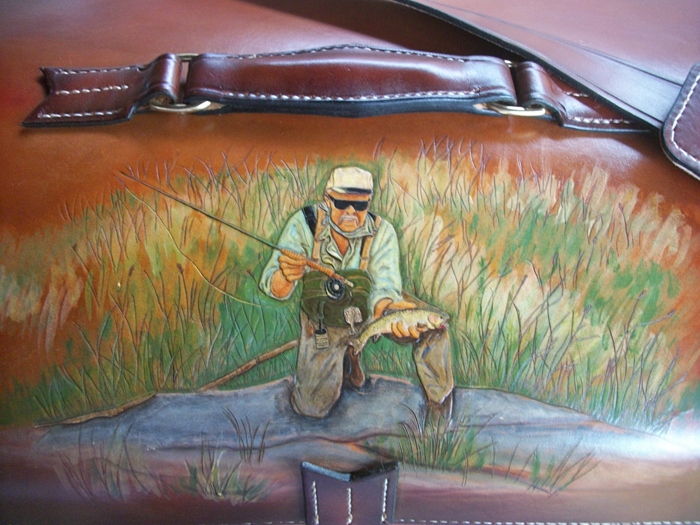 I made this case for Paul Stillmank of Milwaukee, using Paul's own painting of himself and his brother fly fishing, as the model for the image. Paul sent only a black and white image, so I did his own color interpretation, along with creating some of the details. I fully hand carved the scene before painting it. 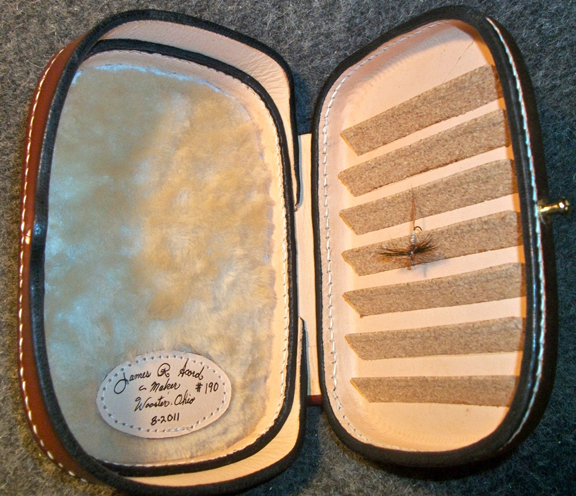 The other side of this clamshell case is very similar to the Mayfly and pine needles design in the case I made for Jim Holm below. This medium size case is 5" x 7" x 1.75". 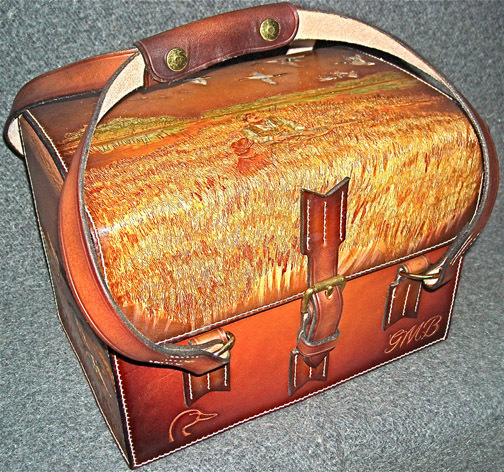 One like this case, carved and paintied with your personal images or equally detailed imagery of any kind will cost $650. and up, plus shipping. 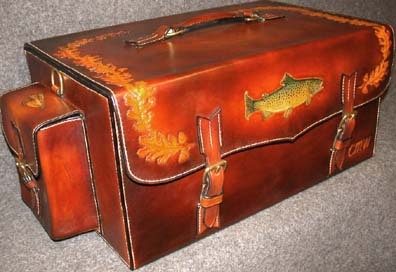 The two pictures above and the detail at left are images of a medium size flycase made for Jim Holm of Pleasant Grove, Utah, who provided me with photos from one of his favorite fishing streams, in order to personalize his box with elaborate and meaningful imagery. The front of the case has an inset of a carved and painted Mayfly, surrounded by Western White Pine needles and cones, which I hand carved, but didn't paint. 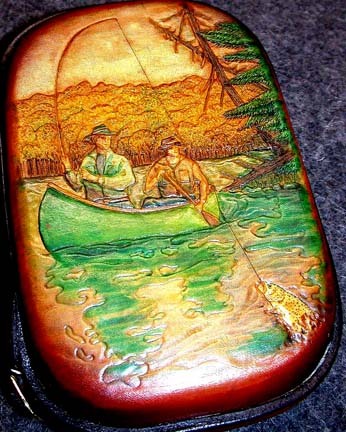 The back of the case is my hand carved interpretation of the buyer's streamside campsite, which he's often shared with his sons and sent me a photo of it, as reference material. This case is 5" x 7" x 1.75". 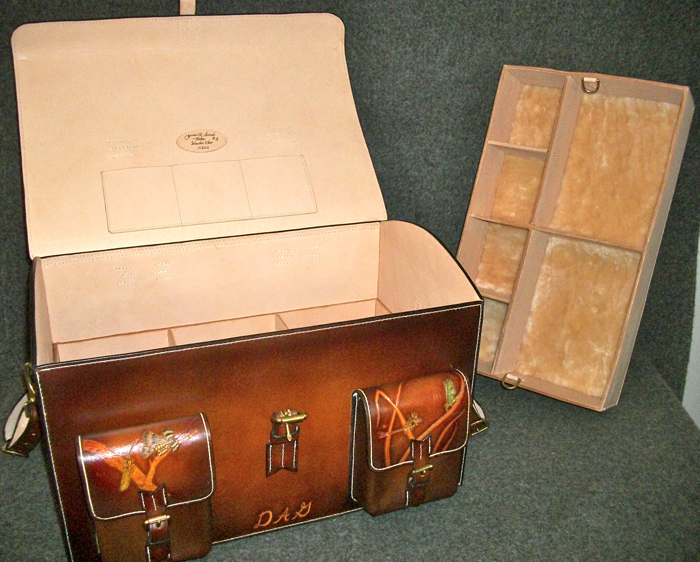 One like this case, carved with your personal images or equally detailed imagery of any kind will cost $650. and up, plus shipping. 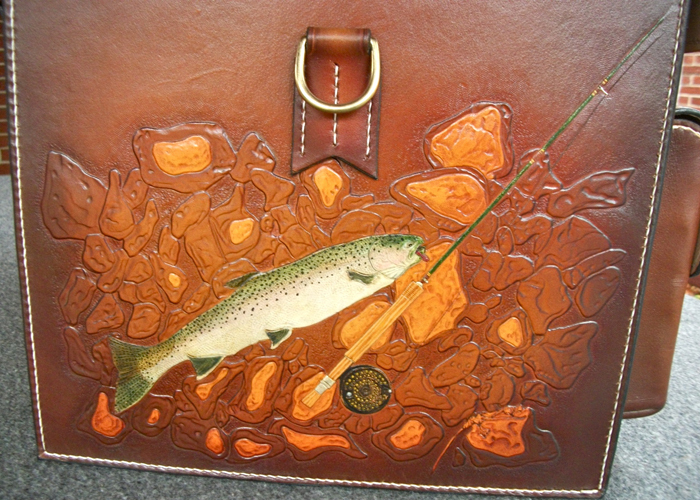 I can make your case order include any Salmon Fly or other image you want. 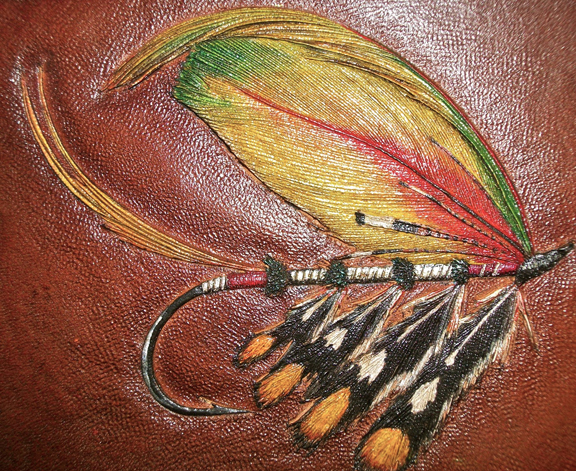 Here is a Salmon Fly invented by Mark Waslick, which was featured in Art of Angling Journal, vol. 1. I made the case for Mary Hubbard of Maryland. This medium case is 5" x 7" x 1.75". 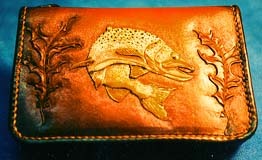 One like this case, carved with your choice of Salmon Fly or equally detailed imagery of any kind will cost $450. and up, plus shipping. 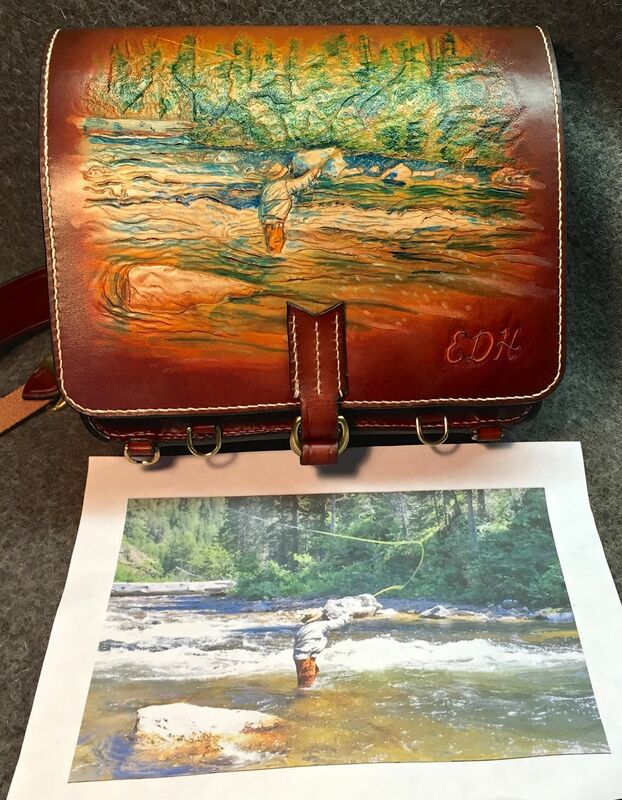 I made this Mohican Streamside Bag with a pictorial carving and painting on its flap, in late 2014 for Elden Hinkle of Chico, California. 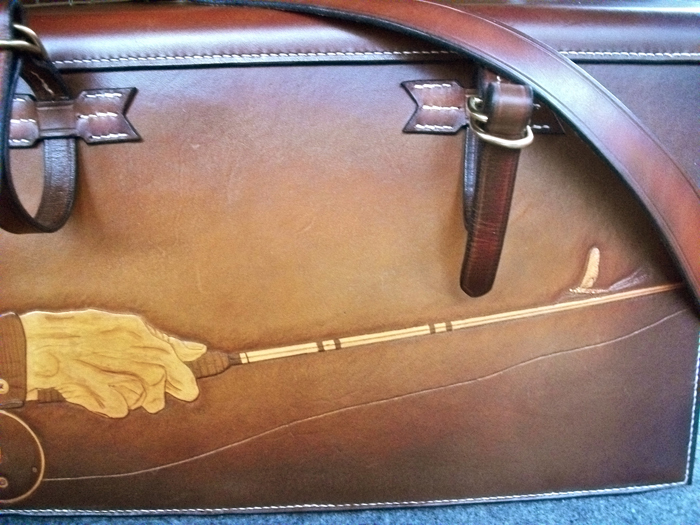 It's a shoulder bag to hold minimal equipment for fly fishing in one day. Size: 9"h x 9"w x 3.5"d. The clamshell case and rod shown in this photo are props, placed here to show the size of the Streamside Bag. A case similar to this one, of equal size and complexity, will cost $800 plus shipping, with a very simply carved case starting at $500, plus shipping. 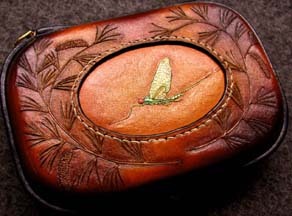 An example of that priced case would be one with one simplle mayfly carved on the flap, and the owner's three initials hand designed and tooled. 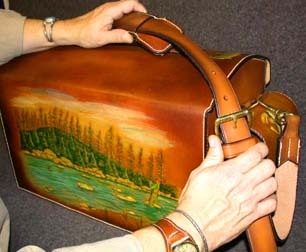 The price of any bag you custom order will depend on its size and complexity of bag construction and imagery. See my front page for other examples of the Streamside Bags. Here's the photo I worked from, which Elden sent to me, of him fishing last summer. You can see that I took some liberties with the photo, to make it work better on my medium of leather and painting. 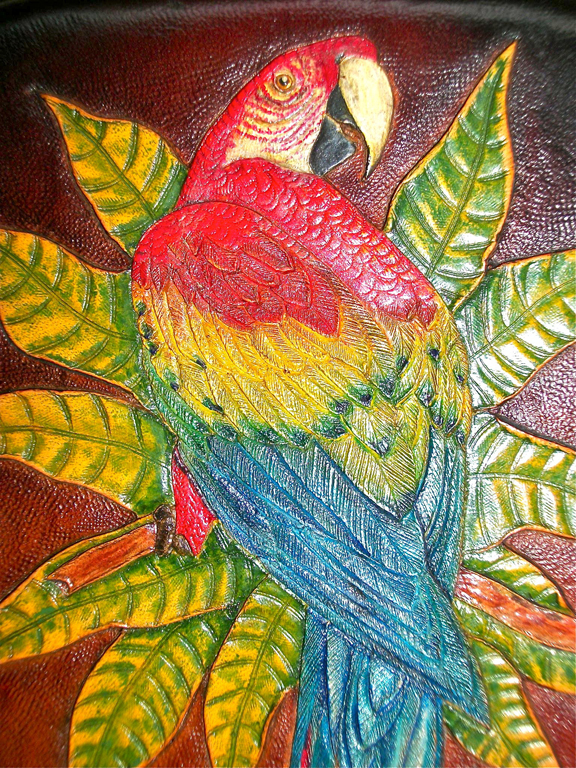 I fully carved the images by hand on the leather, before painting the piece with acrylic paints, using fine brushes. I made this large equipment case in late 2011 for Dave Gunderson of Spokane, Washington. Aside from the front pocket flaps and back panel images, which are my own image designs, Dave supplied photos for all the other carvings/paintings. Size: 20"w x 12.5"h x 12"d.
A case similar to this one will cost $2,500, with a more simply carved and painted case starting at $2,000, plus shipping. Front pockets showing an actual Stone Fly and the artificial version of it (left) and a Mayfly and its tied version (right). In between the pockets are Dave's initials, which are hand designed and hand carved, as I always do. 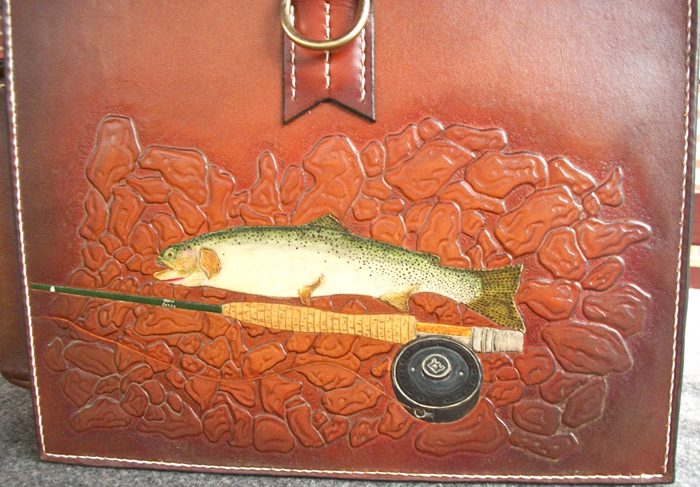 This is the mural I made on the top of the case, of Dave fishing. Side panel with carved and painted scene. This is the back of the case, with straps to attach a rod tube on the outside of the case. Custom dividers and lift-out tray inside the case, for holding fly cases and reels. Small pockets inside the flap, below the label, are for leader packets. Here's a large shell-and-equipment case for water fowlers. 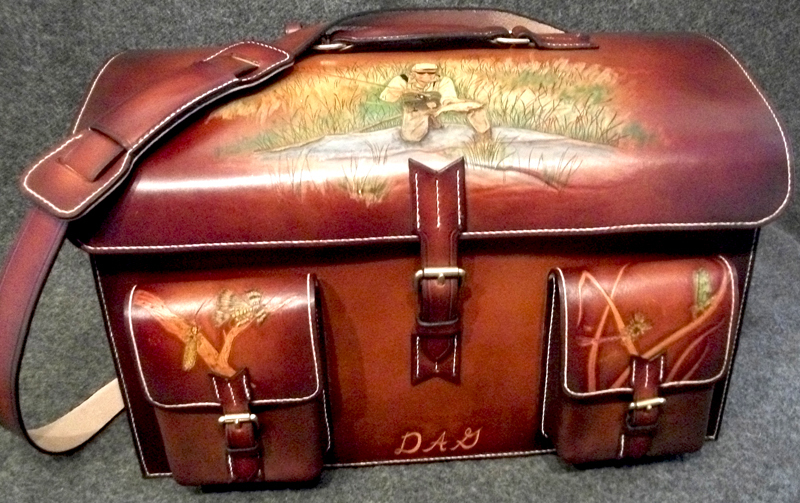 One of my best friends, Garry Buss of California, ordered this elaborately carved case with images of him and his choclate lab, Buster sitting in a wetlands scene, duck hunting. Not shown here are two fully carved scenes on the case's end panels and two large Mallard tail feathers carved on the back panel. I worked from many photo references, including personal photos from Garry to create the hand carved and painted images and scenes. This case has an open area to hold four boxes of shells, along with a lift out tray for duck calls and miscellaneous equipment. At Garry's request, I custom designed a lidded humidor at one end of the tray. This case measures 13.25" x 9" x 9". Made in 2010. Approximate cost of a similar case is $2,500. plus shipping. 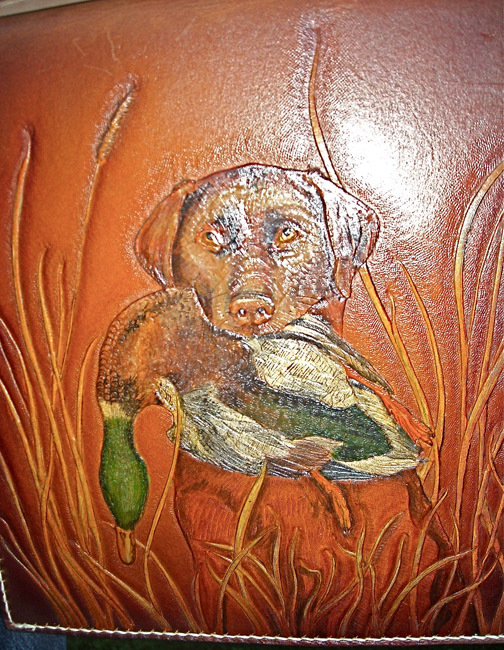 This is one end panel on Garry Buss's case, showing Buster with a mallard retrieve. Here is the tray, slightly lifted. 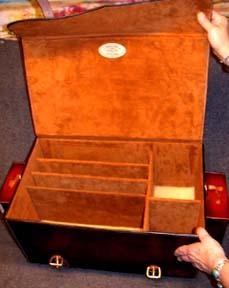 The lidded humidor compartment is on the right. 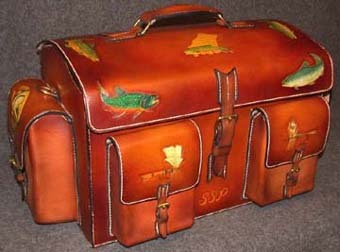 Above is a large equipment case, measuring 23.5"w x 12"h x 13"d. This was designed for John Cella of St Louis, as a surprise gift for his mother, using photos of her Russian Salmon fishing trip as inspiration for Jimmy's carved and painted scene on the back. 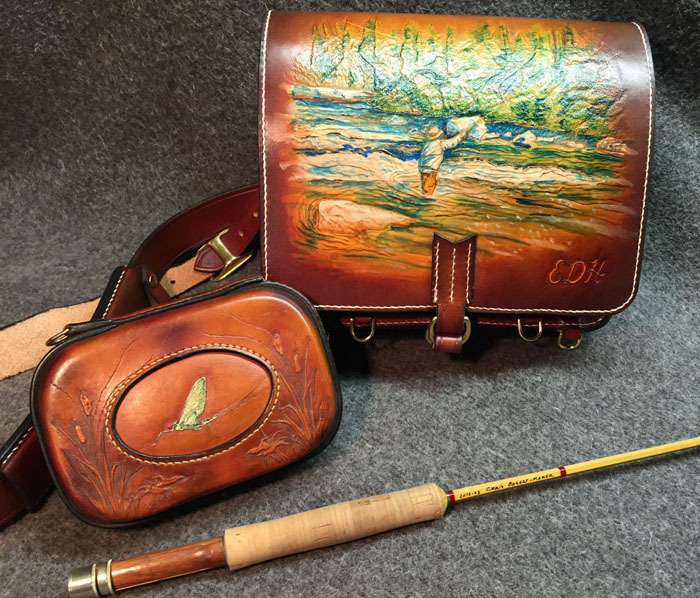 All artwork is hand carved, including four kinds of trout and salmon, specific flies on the pocket flaps, and the owner's three initials hand designed and tooled. As always, this case is all hand stitched, hand dyed, and hand painted. If you order an equipment case, you can choose any flies, fish, and other artwork, including having Jimmy work from a personal photograph. Leather and shearling interior compartments store store equipment neatly. Below are three more images of this piece. 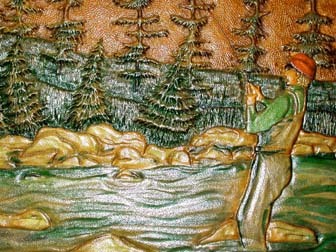 Above is the back of the Cella case, showing the scene Jimmy created, based on photos from Russia and John's mother fishing there. In the detail shot, above right, you see her wearing her lucky red fishing hat, as she hooks up. 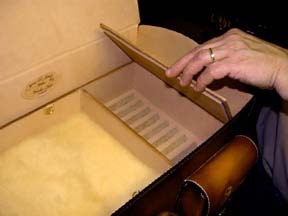 The interior of John Cella's case has this lift-out tray with other compartments beneath it. Here you see the lid being lifted on the large fly storage compartment. Next to it is a shearling padded section for miscellaneous equipment. 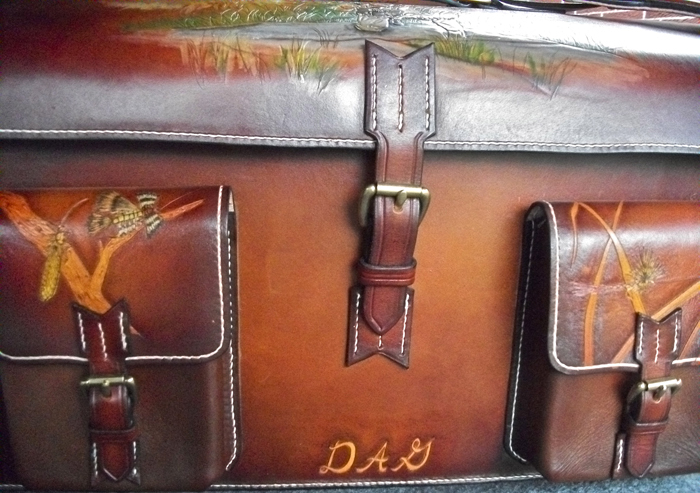 Designed to carry multiple fly cases and reel cases, this very large fly fishing case measures 27"w x 11"h x 14"d and has various interior compartments. 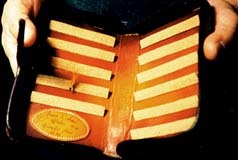 The inside is lined with suede covered dividers. 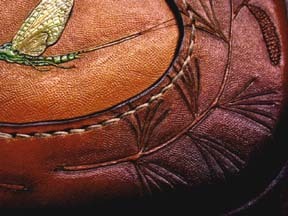 All artwork is hand carved, including oak leaf borders, a brown trout, specific flies on the pocket flaps, and the owner's three initials hand designed and tooled. As always, this case is all hand stitched, hand dyed, and hand painted. If you order an equipment case, you can choose any flies, fish, and other artwork, including having me work from a personal photograph. Interior compartments will be designed to fit your personal equipment needs. This is the interior of Chris Williams' angler's equipment case. Chris chose to have me create dividers to hold three large Loomis fly boxes. The forward compartment holds four reels in cases which I custom made for Chris earlier. Sections on the right side are for miscellaneous items, such as pocket fly cases, etc. There's natural shearling padding in the bottom of each compartment, removable for cleaning. The label includes my signature, the owner's name, the date, and the number of this piece in its category. In this case, it's #1. This case features two flies. The one in the top left part of the case is the tied fly version of a mayfly. The fly on the bottom right in the image is the actual bug in flight. Jimmy can design for your order, an image of any tied fly and the insect that the fly is based on. This one is $400. Here are an opened and closed medium size clamshell case. The opened one shows the cork strips, which I hand build to place inside the case, opposite the shearing side. Price is $400 for one image plus background carving. 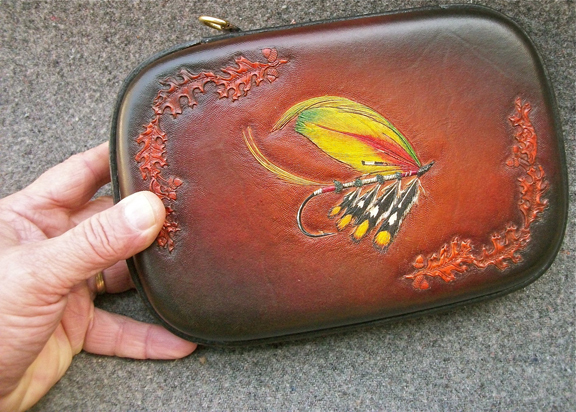 Here is a small clamshell style with a mayfly, which I hand tooled and painted. 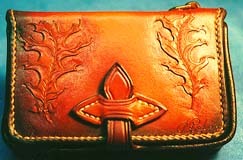 All the oak leaf design is also custom carved. The inside is made with sheepskin on one side and cork strips on the other. Approx. size: 6" x 4" x 1.3", a smaller size box than most made now. This case is sold, but ones ordered like it will be $450. plus shipping. Here are the outside and inside view of the case shown and described above. Web site design © Susan Shie 1997-2019. Site opened October 15, 1997. Made on an Apple iMac, using Dreamweaver. This page last updated January 31, 2019.